The C-word (cancer) scares the hell out of us. A patent will plead, not wanting to utter this horrible word, “Please don’t tell me I have the C-word.” As a word, it is interesting. As a disease, cancer is frightening and formidable. Yet, it is highly interesting to study, to treat, and to hopefully conquer. A chief resident during my surgical training would refer to cancer as crab. On rounds he would refer to Mrs. So and So having a uterine crab or a breast crab. This characterization was crude, awkward, and unbecoming, though accurate historically and etymologically. More delicately and while still avoiding utterance of the word, physicians and lay folk will talk of patients having C-A of the breast, uterus….etc. Like so many words, our modern day word cancer comes to us through Greek and Latin. Hippocrates, who shows up everywhere in medical history, used the Greek word karkinos to describe various growths or swellings in the human body. These growths were found to be hard and firm, like the shell of a crab. And these growths were tenacious, did not go away and held onto the normal tissue of the body like a crab leg pinching your skin. Karkinos is the Greek word for crab. Any modern day pathologist or physician will attest to the accuracy of Hippocrates’ observations. Anyone who has ever felt solid cancers with their hands will attest to its firmness (there are obvious exceptions). Often fanning out of the irregular body of many cancers are tentacles of tumor cells that insidiously latch on to surrounding structures to secure its hold on the normal tissues it has infiltrated. Superimpose a representation of a crab on this observation and we can understand and appreciate Hippocrates’ observation and his word choice. Cancer, then, arrives in our modern day vocabulary from the Latin in the first century A.D. from Celsus. As a non physician at that time, he compiled a compendium of medical terms. Seizing on the crab narrative from the Greeks, the growths noted by Hippocrates were called cancer, the Latin word for crab. 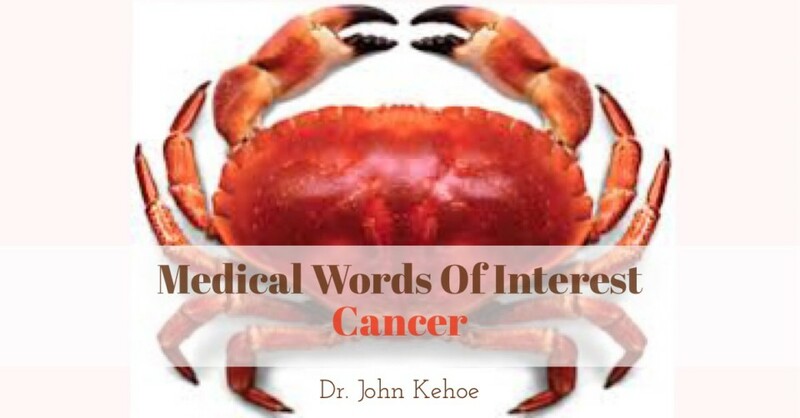 It is one thing to say “I have cancer,” but another thing to say astrologically while introducing yourself, “I am a Cancer, what’s your sign?” Cancer describes not only a disease, but one of our twelve astrological signs. In myth, the Cancer constellation in the sky was assured by Hera after arranging a giant crab to latch onto Hercules’s ankle (lower left hand corner of illustration) as he was fighting the many headed Hydra. Hercules either crushed the hard shell of the crab or flung it away, deep into the sky. In either case, he vanquished the crab. I don’t know why oncologists have not made this image an arousing symbol for our efforts to vanquish this disease. Crush the crab. Vanquish the crab. The Tropic of Cancer marks the northernmost position of the sun in the Northern Hemisphere, thus marking the summer solstice for the Northern Hemisphere. It derives its name from he fact that the sun was superimposed on the constellation Cancer when the summer solstice occurred. This has since changed, but the designation remained. Extending our concept of the word, we often refer to anything awful, odious, and treacherous as a cancer. John Dean back in the Watergate era famously told Nixon that “there is a cancer growing on the Presidency.” The author of Cancer Ward, Aleksandr Solzhenitsyn, claims that his book is really just about cancer and a cancer ward in the USSR. Actually, he uses the dreaded disease as a vehicle to shed light on Soviet society under Stalin. This is all so unfortunate. I love crab meat and crab cakes. I know many wonderful “Cancers.” I know good people who like to go crabbing (cancering?). As an adolescent, I thumbed through my parents’ copy of The Tropic of Cancer looking for salacious material. And there is this horrible disease called cancer which is the focus of my daily work. Well, we will just have to live with all this. A complicated set of disorders and a complicated, broadly used word…..